Defending Junior Men’s National Champion Gage Hecht repeated his title-winning ride at the 2016 Cyclocross National Championships. 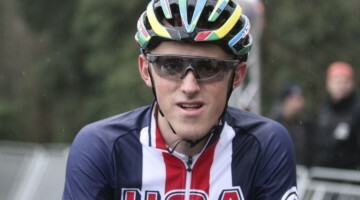 With his performance in Asheville, along with outstanding rides earlier in the season, Hecht was selected to represent the US at the 2016 World Championships in Zolder. 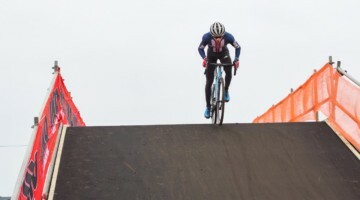 Coming off of his fourth place finish from the year prior, a final corner dropped chain away from a possible bronze medal, and returning as the highest-placed returning Junior from Tabor, Hecht had high hopes for the 2016 World Championships. And while he didn’t best his 2015 ride, he still finished 12th in Zolder, leading the USA team. Hecht and his Alpha Bicycle Co-Vista Subaru squad ride titanium offerings from Moots in Steamboat Springs, Colorado. 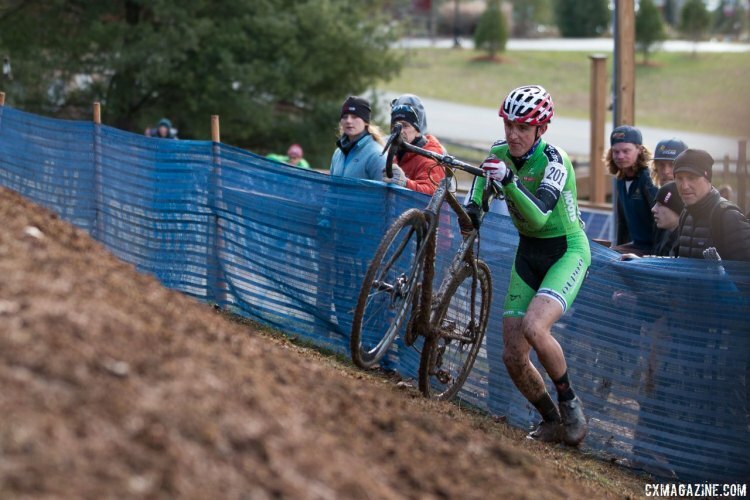 We profiled Hecht’s teammate Katie Clouse’s Moots Psychlo-X earlier. 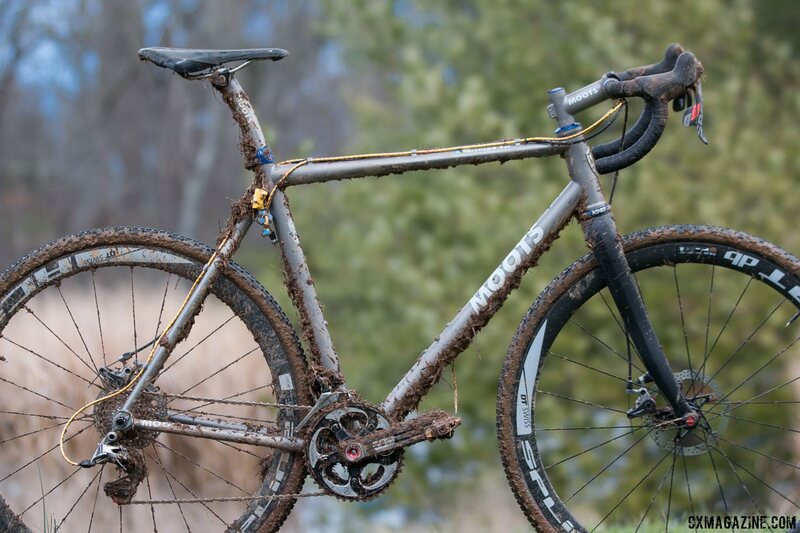 And while we’ve profiled Hecht’s bike before, we’re taking another look at Hecht’s Psychlo-X RSL. The RSL model is the lightweight counterpart to the standard Psychlo-X model thanks to Moots’ tube butting profiles on the RSL. Otherwise, the same materials and processes are used on both frames. Paired with the Moots cyclocross frame offering is a TRP 15mm thru axle CX fork. Hecht is one of the few SRAM riders to use a double ring setup. 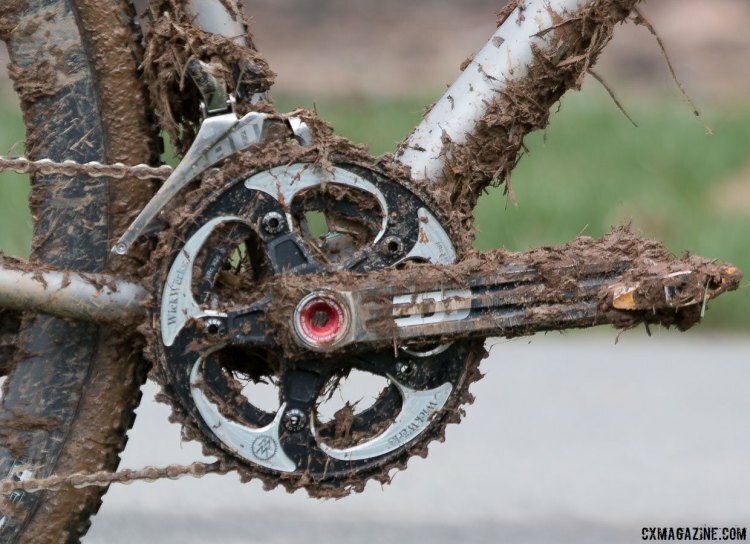 His drivetrain is built from SRAM’s Red 22 components, shifters and derailleurs at least. Like his teammate Clouse’s bike, his derailleur cables are shod in Gold Jagwire Road Elite Link housing, which is a claimed 20% lighter than standard housing as well as more durable, and adds some bling. His crankset is a Rotor offering with WickWerks rings bolted to it rather than a SRAM Red set. Hecht’s brakes are also unusual for riders at his level—cable-activated disc brakes in the form of TRP’s dual piston Spyre SLCs. For his contact points, Hecht has a Fizik Antares VS saddle perched atop his titanium Moots seatpost along with a ti Moots stem with Pro’s PLT bars, rolled seemingly high with his SRAM Red 22 hoods set high as well. 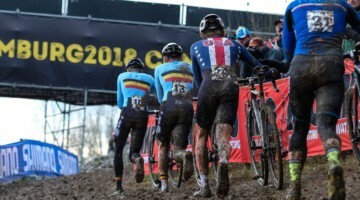 The whole setup rolls on DT Swiss RC 38 Spline T DB carbon tubular wheels wrapped in Clement’s PDX tubeless tubular tires for Nationals, as he did in the muddy conditions in Zolder. 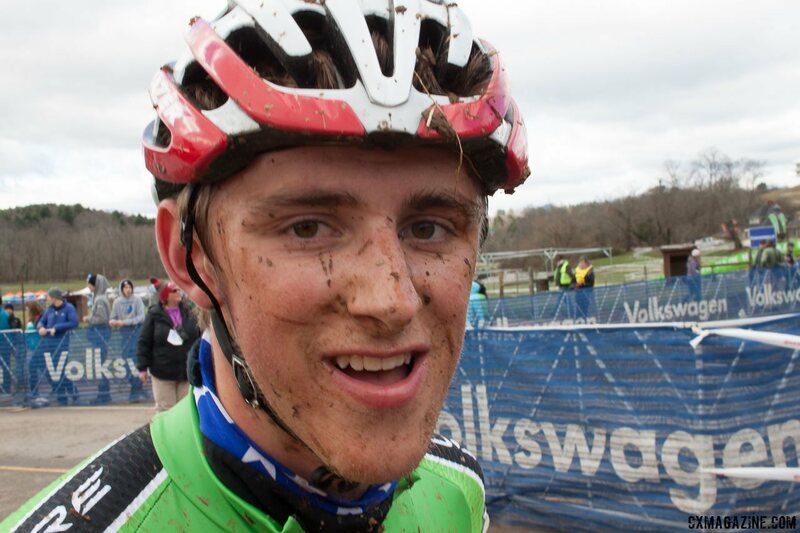 Hecht may not have had the ride he wanted at Worlds, but we suspect there’s more to be seen from this young rider. That’s a TRP 15mm CX fork on his and Katie’s bikes.